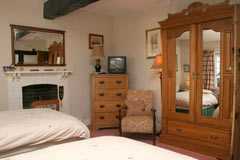 "Arbour House is a fine Grade II listed home, with flagstone floors, oak beams and log fires. 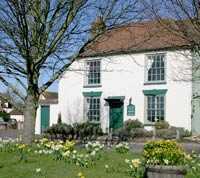 It stands behind a small village green, in the riverside village of Wyre Piddle." 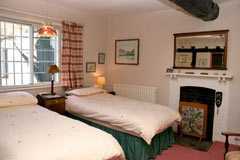 For a warm welcome you are invited to come and stay with us in these wonderful Worcestershire surroundings. Whether you are looking for a quiet break in the beautiful Cotswold countryside or for somewhere to stay on business that is great value and close to all the major cities in the Midlands, we offer bed & breakfast accommodation that will delight you. Arbour House is a fine 16th century Grade II listed character home, with flagstone floors, oak beams and a wealth of original features. It overlooks Bredon Hill and stands behind a small village green in the quiet riverside village of Wyre Piddle, which boasts a Church, pub and restaurant. Pershore, an unspoilt market town renowned for its Georgian architecture and impressive Norman Abbey, is less than two miles away and offers a wider choice of restaurants, a small cinema/theatre and several unique shops. We are also close to the county town of Worcester situated on the beautiful River Severn and all the major motorway links, where you can be in the centre of Birmingham in 40 minutes with Cheltenham, Gloucester and Bristol likewise within easy reach. Cash and Cheques accepted, sorry we are not able to take cards. We are more than happy to cater for vegetarians or people with allergies. If you have any special requirements, don't hesitate to get in contact with us. 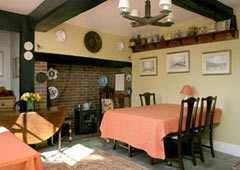 The Dining room is in the oldest part of the house with original beams and flagstone floors. Individual tables ensure that our guests can enjoy their breakfast in relative privacy. 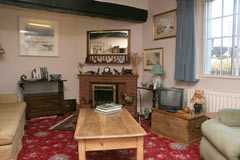 The comfortably appointed Sitting room has a colour television and a good selection of books and games. A short walk from Arbour house is a pub situated on the riverside which serves both food and traditional Ales and Beers. Three of the four individually styled bedrooms have en suite facilities- 2 twin and 1 double, with the remaining double bedroom having private bath/shower room. 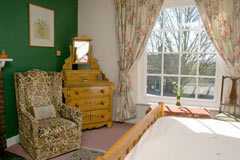 There are colour televisions, tea and coffee making facilities, radio alarms and hair dryers provided in each room. Worcester ( 8 miles) - With its Cathedral, Civil War Museum, Racecourse, County Cricket Ground and the home of Royal Worcester Porcelain and its Museum and retail outlet.